As many of you will recall from the many previous posts on the subject, I have been awaiting audio from Linux.Conf.Au 2005 so that I can complete the video of my seminar at the Security Miniconf and put it online. A couple weeks ago I received a google alert which pointed me to one of the organiser’s blogs. That blog outlined some problems with the audio. Tonight I have recieved an email (which was sent to the LCA-Announce mailing list) further outlining audio problems etc. The full email is quoted below. Unfortunately, this does make it almost impossible to continue with the video, I’ll just have to wait and see if I can use any of it at all, and I suspect that wait will be semi-lengthy. On the bright side, if I can make use of it I might be able to check if my name was called out as a laptop winner on one of the mornings that I missed the announcements by a few minutes, if it wasn’t then I will be happy I didn’t miss anything…if it was, well, then I’ll be preparing to yell at Nourthbourne Avenue for a while. All the papers we have been able to gather from our speakers are now online. setup we have been unable to recover any realistically useful audio data. see if there is any hope of getting more out of this. next 30 days after this email. towards making lca2006 the best linux.conf.au ever. Thanks from the lca2005 crew. Were you surprised by the doping allegations against Lance Armstrong or have they proven your suspicions? 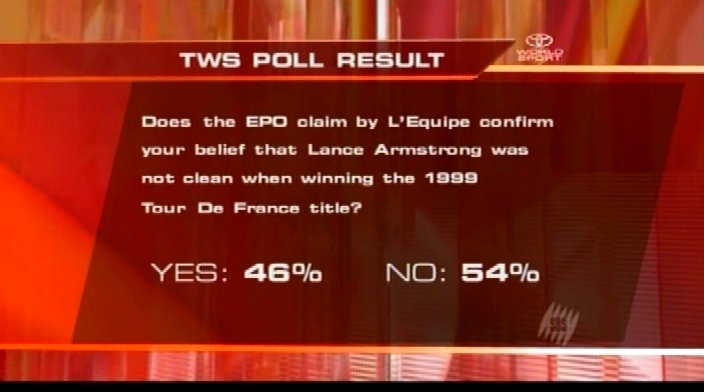 Does the EPO claim by L’Equipe confirm your belief that Lance Armstrong was not clean when winning the 1999 Tour De France? So SBS changed the question overnight without telling anyone and then published the results. Congratulations SBS, you sure do know how to make a mess and pretend you didn’t. To change the subject, this post is officially the first one to have a samuelgordonstewart.com picture.